The Dalmatian is a healthy, lively dog that has few problems. They remain playful and active into old age. The daily walk, running after a ball, or throwing a stick. These are activities you can do with your Dalmatian for years. In short, the Dalmatian dog can luckily be called a healthy breed. There are however some issues of the breed that us breeders pay extra attention to in making the breeding combinations. This will be discussed in this section, so you, as the buyer of a puppy, are well informed in this respect as well. 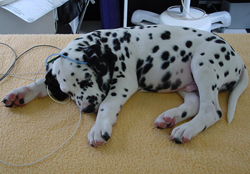 Deafness occurs among Dalmatians. This is however not the only breed in which deafness occurs, and there are breeds, such as the Argentine Mastiff, in which the percentage of puppies born deaf is much higher than in Dalmatians. Globally, clubs and breeders of Dalmatian have been paying attention for years to reducing deafness. An experienced breeder recognises a deaf puppy in the litter when they’re between three and four weeks old. In breed clubs, these puppies are usually put to sleep. After all, a deaf puppy can be a danger to its surroundings. They are unreliable in traffic and can act aggressive caused by fear towards other dogs and children. The puppies that can hear from one ear are much more difficult to recognize. These puppies react actually quite normal. Both you and the dog will not notice this one-side deafness. Before the mandatory hearing test for Dalmatians was introduced in several countries, breeders of Dalmatians didn’t know about the existence of unilateral hearing dogs and therefore bred with unilateral and two-sided hearing (bilateral) Dalmatians interchangeably. Around 1996, a number of breed clubs, also in Germany and the Netherlands, have made the hearing test for litters born within the club compulsory. This hearing test is performed by dedicated veterinarians that have purchased so-called audiometric equipment. This test provides information about the unilateral and two-sided hearing puppies in a nest. For this hearing test, the puppies are very lightly sedated to make testing easier and the results as reliable as possible. The puppy gets a needle with an electrode on top of its head and an electrode in its little ear. We will then see the results of the registered brain waves on a computer screen. A certain pattern of peaks and troughs have to show in the results to prove that the dog can hear with that ear. In case of a nearly flat line, we are dealing with a deaf ear. Tests are performed at 70dB and in case of doubt once more with 90dB. The tested dogs all receive an official hearing test certificate. You will obviously receive a copy of this official hearing test in your kennel folder. The puppies are usually tested when they’re between 6 and 7 weeks old. In Germany and the Netherlands breeders only breed with two-sided hearing dogs. De eenzijdig horende pups krijgen wel een stamboom mee om eventuele inzet in de fokkerij in de toekomst mogelijk te houden. HD is a malformation of the hip joint in which the head and the ball aren’t properly aligned. In very severe cases of HD there isn’t even a ball anymore, and the head will be completely separated from the pelvis and will only be somewhat kept in place by the tendons and ligaments. HD rarely occurs among Dalmatian dogs. It therefore can definitely not be called a health problem for this breed. Our dogs are tested for HD to make sure HD won’t become a problem in our breed. We address this issue on our website, because HD is often called a large problem among purebred dogs in general. You can imagine that a dog that had a severe form of HD will not be able to walk properly and will be in a lot of pain. HD usually comes with bone abnormalities and malignant bone growth along the edges of the head and the ball. There are breeds in which HD has become a real problem. HD is partially genetically determined. We write partially, because there are several other influences that can also cause HD, such as too many and wrong movements in their growth stage or feeding bad quality food! This means that the ancestors of the dog could have passed on certain genes to their offspring, who will be more at risk of obtaining this hip malformation. It is known that the heavier breeds are more at risk. Especially when these puppies are also being fed the wrong food and/or get the wrong exercise in their fast growth stage. Furthermore, dogs that are much too heavy are also more at risk. An accident such as a bad fall or a collision can lead to damage of the joint which can lead to HD.